There are a number of reasons why your cat may be not using the litter box and you may need to do some sleuthing to find out how to fix this problem. Is he peeing outside the litter box – or pooing outside the litter box – or both? Pooping outside litter box is usually because of a physical problem whereas peeing outside the litter box is more often because of some sort of emotional or anxiety related issue. After you have checked out that there are no physical problems (see my article on cat pooping outside litter box) follow the steps below sequentially. … if you don’t already have one. Some cats certainly prefer to urinated in one box and pass their stools in another. In some litter box problems this will eliminate the problem immediately. Some cats prefer to be secluded and an enclosed litter box will be best for them. Whereas other cats will find it too scary to be shut in. Is the litter box roomy enough? Watch your cats body language when in the box and try and understand her particular needs. Is the litter box clean? Some cats refuse point blank to use a soiled litter box. If this is your cat you must keep the litter tray immaculately clean and remove stools as soon as they appear. Is it miles away in the far end of the house and does you cat like to be constantly around you? If so, then you may need to move the litter box to a more trafficked area so the cat does not feel she is going of alone to China to use the litter tray. And of course, there is the opposite – i.e. the cat that WANTS to go away to China and be totally secluded and alone when doing her business. Again, this depends on the temperament of the individual cat. You cat simply may not like the feel of the litter, so try different types to see if any make a difference. For example, if you are using a hard, pellet style cat litter – try a softer one such as the paper or sand type litters. Even go outside and dig up some fresh earth to use, and give that a try. 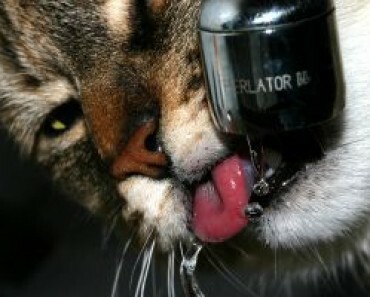 The natural, earthy smell may help you cat be more inclined to use it. If you are unable to find a way to relieve your cat’s anxiety, then I would suggest that you look into getting a Feliway Spray diffuser. This is a product that has been specially developed to help cats cope with stress. It emits a synthetic copy of the natural cat pheromone, which felines use to mark their territory, and means it is safe and secure for them. The cheapest place to buy Feliway is usually here: Feliway Plug-In Diffuser. You can also read my Feliway Spray Reviews page for more information on this product. Good tips here. I love your cat site and there is so much helpful information. I have shared it on facebook too. This will be a fantastic blog, will you be interested in doing an interview regarding cats for my own kitty website? If so e-mail me!